Do you know what our most popular room is for nautical murals? Believe it or not, it is the bathroom! 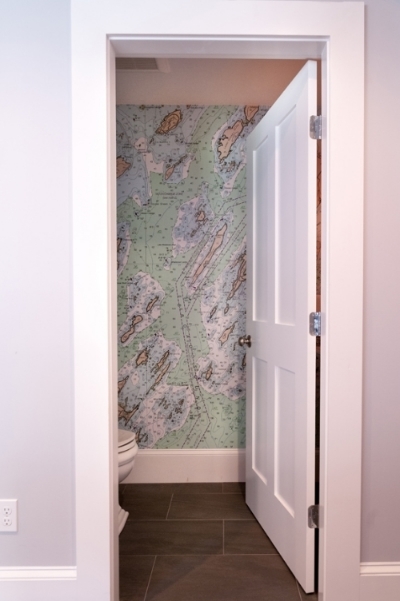 Perhaps all that running water brings nautical inspiration, but for the past several years, bathrooms have been the most popular location of our murals. Bathrooms are easy to plan as they mostly have three walls due to the shower taking up a wall in many cases. Here are some great bathroom ideas from our clients, Travis Kinney with the green bathroom, and nautical accessories to make him bathroom look shipshape! Sara Fisher of Indesign in Charlevoix Michigan, used a single chart to cover 8 walls in a single bathroom. Julia Reinalda of In Good Taste Interior Design worked with us on this multi-wall gable bathroom for her client. Contact us with questions at 801-367-7945.